Well there you have it folks; the poster says it all… but that’s not really true. Come on. 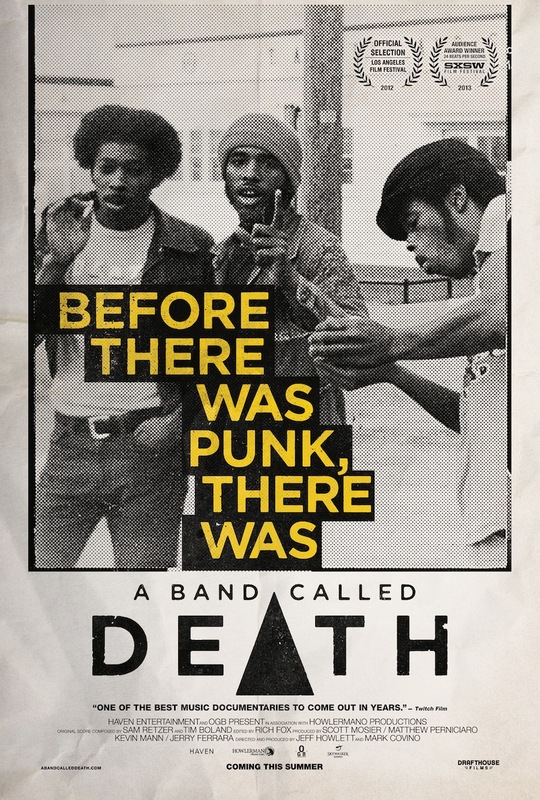 Maybe some people think that “before there was punk, there was a band called Death”, but we all know the truth; you could just as easily say “before there was punk there was a band called the Stooges, MC5, New York Dolls, Modern Lovers, Dictators, Electric Eels, Mirrors, Rocket from the Tombs, Simply Saucer, Dogs and a bunch of 60s garage bands.” The fact is that, had Death released their music in 1975, they would have been one of many bands like the Dictators or the Flamin’ Groovies whose pre-punk brand of rock would have won an audience among the hip, “in the know” people of the era while the rest of the mainstream would remain oblivious. Now that I’ve got the negative part of the review out of the way, let’s discuss why I thought A Band Called Death is a good movie! Well, it’s a not a good movie or a good documentary. Our filmmakers Mark Christopher Covino and Jeff Howlett aren’t exactly artistes or have a whole lot of style. They just stumble their way through the film and are helped by the genuine fact that they’re telling a compelling story. The work was sort of done for them. Either way, I liked it. Death was founded by David, Bobby and Dannis Hackney, three of eight children, who were spiritually awoken upon watching the Beatles perform on the Ed Sullivan show in 1964. It wasn’t long before David picked up the guitar, Bobby went on bass and Dannis sat behind the drum kit. At first they played a mixture of funk and rock but, by 1974, they officially coined themselves Death because, as David Hackney said, “death is real” and went for pure rock ‘n’ roll. As the story goes, Death amassed some wickedly killer material – a hard rock/punk rock hybrid of hard edge Who riffs and Hendrix-y solos – and thrashed it out in their local Detroit ‘hood for a few years, annoyed the local neighbors who probably preferred the sound of Motown over loud rock, recorded a demo, ditched a major label deal because Dave Hackney didn’t want to change the group’s name, relocated to that punk rock central known as… Vermont, changed their name to the 4th Movement and became a Christian rock band. After releasing one record, they broke up, Dave Hackney moved back to Detroit and the rest of the band hooked up with new players and became a reggae band called Lambsbread. Then, years later, a few savvy record collectors discovered a Death 7″ single for the songs “Keep on Knocking” b/w “Politicians in My Eyes”, which went for a small fortune on eBay and the living members (David Hackney passed away in 2000) dug up the old tapes out of their Detroit attic and authorized their release as the album …For the Whole World to See. The band toured with their kids’ band Rough Francis in the support and everyone lived happily ever after or something. Again, let me stress, I like Death a lot. A lot lot. Their record is awesome! They have a second one called Spiritual Mental Physical, which has a bunch of demos on it and that one is also great. And the story of discovering old tapes is always interesting. But it’s not unique. In fact, two years ago there was a documentary on Pentagram whose story, though not exactly the same, has similar parallels. The point is I’m glad the record came out and that Death got their due. In my estimation though, they should have told brother David Hackney, “listen dude, we’re changing our goddamn name because Arista have a deal for us” or, at very least, they could have moved to New York where there was a punk scene like the Dead Boys did. As for the movie, we get some neat tour footage, some interviews, some spiced up photos, a tour of the old house, etc., but nothing that will blow you away. Like I said, the story speaks for itself. Oh, one last thing; the interview subjects outside Death and their group of close friends/family were Henry Rollins, Alice Cooper, Kid Rock, Mickey Leigh (Joey Ramone’s younger brother), Elijah Wood (?!) and some record collectors. Come on, kids… where was Iggy, Niagra, Wayne Kramer or any of the underground heroes of Detroit’s rock scene?